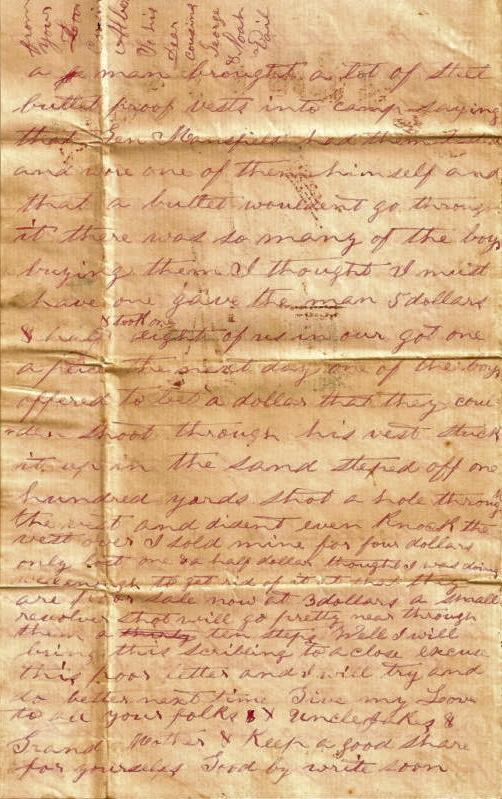 The following letter was transcribed directly from the internet where it was offered for sale. 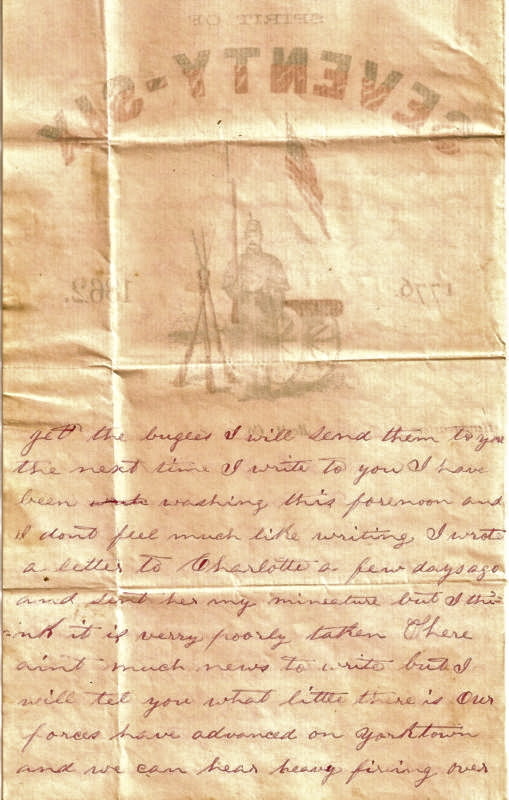 It was written by a private named Albert in Company D of the 20th Indiana Infantry Regiment (the “Fighting 300”). A review of the company roster suggests that it was probably written by Albert J. Cox of Portland, Fountain County, Indiana who enlisted on 22 July 1861 and was mustered out on 29 July 1864 after three years’ service. Albert was eighteen years old when he enlisted (born 1843). He was the second oldest son of Joshua Cox (1803-1889), a North Carolina native, and Margaret Isler (1820-1895), a native of Pennsylvania and the daughter of Virginian Nathaniel Isler (1791-1856) and his wife Charlotte. Joshua and Margaret were married in December 1837 in Fountain County, Indiana. Joshua practiced medicine in Portland (now called Fountain) in Fountain County — an early trading post on the Wabash River near the mouth of Bear Creek. Albert had an older brother named William H. Cox, born 1840, who became a lawyer in Fountain County. He also had a brother named John M. Cox, born about 1845; a brother named Philander Cox (1848-1928); a sister named Charlotte Cox, born about 1855; and a sister named Margaret Cox, born about 1858. 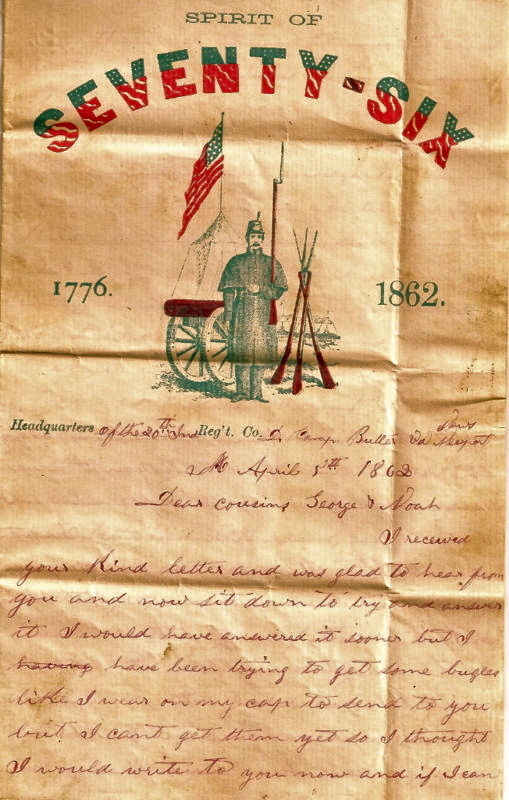 The letter humorously describes the sale of “bullet proof” vests to soldiers at Camp Butler in Newport News, Virginia, as the 20th Indiana Infantry awaited deployment further south. I received your kind letter and was glad to hear from you and now sit down to try and answer it, I would have answered it sooner but I have been trying to get some bugles like I wear on my cap to send to you but I can’t get them yet so I thought I would write to you now and if I can get the bugles I will send them to you the next time I write to you. I have been washing this forenoon and I don’t feel much like writing. I wrote a letter to [your sister] Charlotte a few days ago and sent her my miniature but I think it is verry poorly taken. There ain’t much notice to write but I will tell you what little there is. Our forces have advanced on Yorktown and we can hear heavy firing over there all this afternoon. I expect to hear of our forces taking the place by tomorrow morning. You asked me how I liked playing soldier. I like it just well enough to stay in the service (well contented) until this rebellion is put down and the old stars and stripes are flying over every secesh state in the South. After that is done and peace is declared then I want to be discharged as soon as possible. I don’t know how soon we may leave this place or whether we will leave it at all or not. We may go with an expedition to Norfolk or Richmond. In either case, we will start soon, in my opinion. But if we don’t go to one or the other of them places, I think we will stay here for sometime to hold this place. 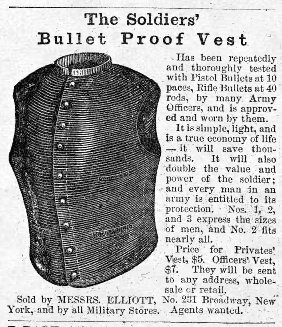 An advertisement in March 1862 Issue of Harper’s Weekly Magazine for a bullet proof vest. I must now tell you a little joke on myself. A few days ago, a man brought a lot of steel bullet proof vests into camp saying that Gen. [Joseph K.] Mansfield had them sent and wore one of them himself and that a bullet wouldn’t go through it. There was so many of the boys buying them I thought I must have one [and] gave the man five dollars and half. Eight of us in our [company] got one a piece. The next day one of the boys offered to bet a dollar that they could shoot through his vest. [He] stuck in up in the sand, stepped off one hundred yards, shot a hole through the vest, and didn’t even knock the vest over. I sold mine for four dollars – only lost one and a half dollar. Thought I was doing well enough to get rid of it at that. They are for sale now at 3 dollars. A small revolver shot will go pretty near through them at ten steps. Well, I will bring this scribbling to a close. Excuse this poor letter and I will try and do better next time. Give my love to all your folks & Uncle Jake [Jacob Isler] & Grand Mother [Charlotte Isler] & keep a good share for yourselves. It is not known which company “Bartlett & Munn” represented. 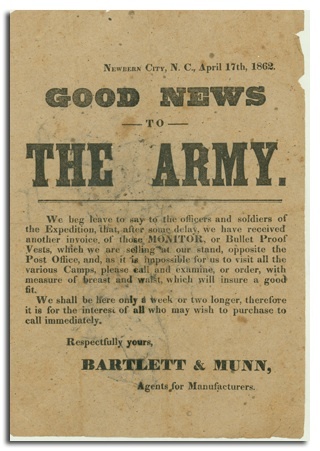 Advertising to Ambrose Burnside’s troops, who had occupied New Bern, N.C. on March 14, 1862, they name their vests “Monitors,” in obvious reference to the Union ironclad who had stood toe to toe with C.S.S. Virginia in the Battle of Hampton Roads on March 8-9, 1862. Farwell, Byron. The Encyclopedia of Nineteenth-Century Warfare (New York, 2001), p. 128. This is an amazing letter. 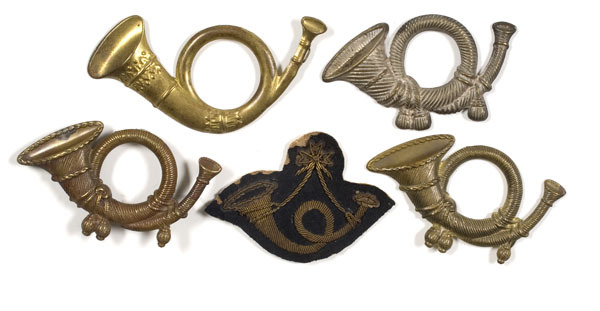 My relative was also in Co d of that regiment and was killed only 3 months later of wounds in the Peninsula Campaign. Thanks! This letter helped me with my History 300 paper on entertainment during the Civil War. 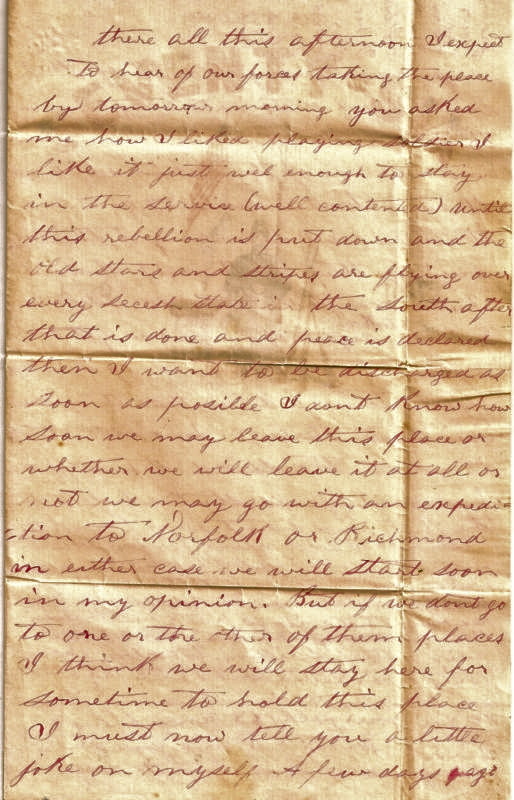 it was a great primary source, to be able to connect both the personal letter and the advertisement!